July 1873: the zamoto Okuda Toichirô opened his own theater, the Okudaza, in the district of Hongô Haruki-chô. The zagashira was Yamazaki Kawazô and the leading actor was Okuda Tomisaburô. October 1875: the Okudaza went bankrupt and the management was taken over by Fukae Tôbê, who renamed the theater Harukiza. May 1885: first performance at the Harukiza of the Torikuma Shibai troupe. 23 June 1890: a fire destroyed the Harukiza. December 1891: the Harukiza reopened with the shûmei of Nakamura Tomijûrô III, Azuma Tôzô VI and Nakamura Baiju. The others actors were Ichikawa Ennosuke I, Ichikawa Yaozô VII, Nakamura Shikaku I, Nakamura Komanosuke VI, Nakamura Kangorô XII and Ichikawa Utasaku. January 1896: revival at the Harukiza of the dance "Kashiragaki Ise Monogatari", staged under the title "Noriaibune Ehô Manzai", with Ichikawa Ennosuke I and Nakamura Kangorô XII performing the two comic dancers. 1896: a stock-company was created to manage the Harukiza. Its name was Harukiza KK. 23 March 1898: a fire destroyed the Harukiza. March 1902: The Harukiza was renamed Hongôza. 1910: the Hongôza was purchased by the Shôchiku. March 1923: premiere at the Hongôza of Matsui Shôyô's drama "Satsuma no Yodogimi". The leading role of Lady Yodo (Yodogimi) was played by Nakamura Utaemon V.
1 September 1923 (11:58 AM): Tôkyô was destroyed by a powerful earthquake called Kantô Daijishin, which killed more than 200,000 people; the Hongôza was burnt to ashes. 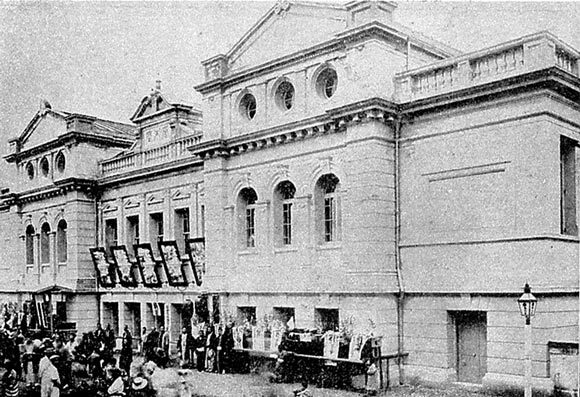 April 1930: the Hongôza became a movie theater. 10 March 1945 (00:08 AM): 344 US Army B29 bombers dropped 2,000 tons of bombs on Tôkyô, killing more than 120,000 people and destroying almost everything; the Hongôza was burnt to ashes. This theater was no more rebuilt in the post-war years.